WHY IT MATTERS: Our region does better when we are engaged with one another and working together for a more abundant future. At its best, that strength of purpose can translate into a stronger economy. There are countless ways to connect, meet our neighbors, grow our community, and create a better, shared future. Shaping a new economy requires engaged residents committed to a long term vision. Volunteering, giving and voting are three easily measured and important ways we engage; they often times serve as the entry point to community leadership. Through engagement we learn how decisions are made, where to find and access reliable information, dialog with neighbors and leaders, and ensure each of us has a voice in shaping the future. 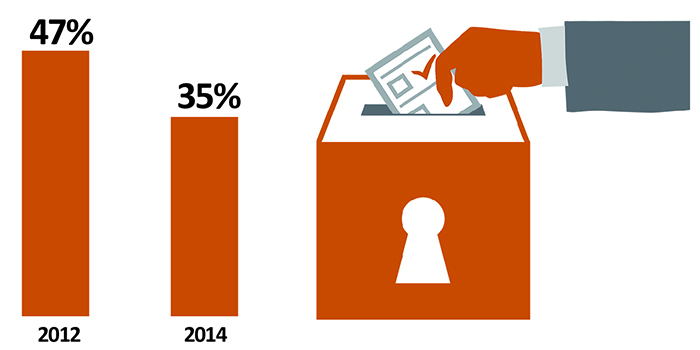 Voter turnout is a common measure of resident engagement through civic participation. In the most recent mayoral election, Wisconsin Rapids saw 3,376 voters head to the polls (35% turnout). Although turnout fell from the previous mayoral election, our electoral participation remains well above the national turnout norm of 25%. Volunteerism is another indicator of a connected community. 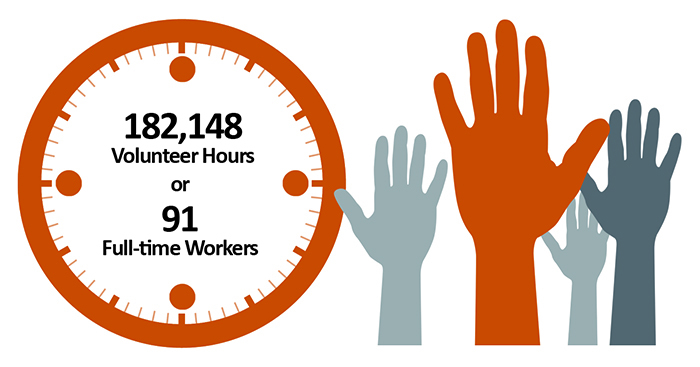 United Way of Inner Wisconsin reported over 182,000 hours volunteered in 2013; that is the equivalent of 91 people volunteering as their full-time job! High school students are actively involved. For example, Lincoln HS logged 9,836 volunteer hours this past year alone, which is almost 44 hours per student. Each year, Incourage’s Teen Leadership program provides unique, hands-on engagement experiences for local sophomores in all five high schools with 149 youth participating since 2006. A key opportunity is engaging the waves of retirees who were the innovators of their time. They have experience, knowledge and history to share with a cadre of youth as our community works to shape a new economy. Financial contributions are another measure and means of community engagement. While charitable contributions are notoriously tricky to measure, our best numbers show that SWCA gives less per person to charities and other non-profits than does the rest of Wood County, the rest of Wisconsin, and the rest of the United States. 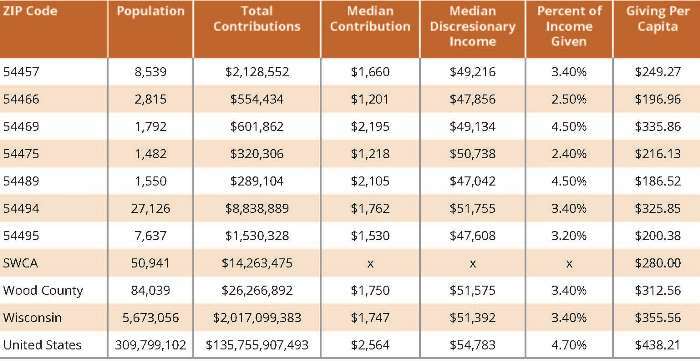 Charitable contributions in south Wood County constitute more than $14 million per year, or about $280 per person. The national average is around $430 per person. Physical space strengthens the connection between people and place. Our built environment reflects the vision of how residents see their community and is a critical factor in attracting new residents, jobs, and investment, and retaining those connected to this place. 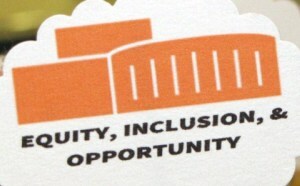 Buildings and spaces matter for inclusive communities designed to work well for all. Incourage is embracing this understanding through the Tribune Building Project – a resident-centered redevelopment effort in downtown Wisconsin Rapids. The project began in December 2012 when Incourage purchased the former Daily Tribune property with the intent that residents would decide its future use. The building has served as an architecturally unique symbol of local information and communication in our community for over five decades. 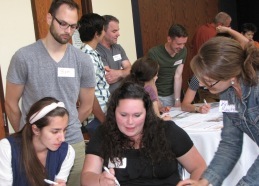 Decision-making began by welcoming any and all community members to share their ideas for the future of the 20,000 sq. ft. space. To date, more than 700 residents have been involved; over 25% are under the age of 18. Recommendations for use of the space include a number of local food-focused entrepreneurial operations: culinary kitchen, microbrewery and café have topped the list. In September 2014, Incourage’s Board of Directors resolved to permanently own the property. Once complete, the Tribune Building will serve as an important physical manifestation of resident ownership in local community development. Our shared investment has grown to become about far more than the adaptive redevelopment of a historic downtown landmark. This space advances: the value and importance of relationships and human potential; an environment that fosters risk and accepts failure; creativity, innovation, and new enterprise. We believe that through this process, residents have a renewed expectation for their role in future development efforts – as equal partners in shaping a community that works well for all people. Complete details about decisions made by residents at all 10 meetings are online at TribuneBuilding.org. Charitable Giving in SWCA, WI and U.S.
Vital Signs covers the south Wood County area of Wisconsin, including the municipalities of: Biron; Cranmoor; Grand Rapids; Nekoosa; Pittsville; Town of Port Edwards; Village of Port Edwards; Town of Rudolph; Village of Rudolph; Saratoga; Seneca; Sigel; Vesper; Wisconsin Rapids; and Rome in Adams County.